Peregrine falcons are one of only two birds that can be found worldwide, except Antarctica. Can you name the other bird? Welcome to the 19th season of the Jersey City Falcon Cam! Since 2000, state endangered peregrine falcons have nested on a skyscraper rooftop in Jersey City, New Jersey. The cameras were activated on 2/21/19. Welcome to the home of the Jersey City Falcon Cam – a popular webcam that has captured the annual life cycle of a pair of state endangered Peregrine falcons nesting on a Jersey City skyscraper. This is the 19th season of 24/7 live streaming video, which is the oldest online streaming wildlife focused camera in New Jersey! In 2014, Conserve Wildlife Foundation undertook a fundraising effort to save the Falcon Cam, which was run by the New Jersey Division of Fish and Wildlife's Endangered and Nongame Species Program. We'd like to thank everyone who donated to help keep the Falcon Cam online!! Please consider making a donation to support the Jersey City Falcon Cam. Above you see two views: one from outside of the nestbox, and one from inside the nestbox. If you have any technical problems, please email Ben Wurst. Watch, listen, post photos, and interact with biologists. 41/AX has been busy since our last update - she laid egg #3 on April 7, and # 4 on April 8. Peregrine clutches average 3 to 4 eggs, that are inclubated for about a month. It appears that 41/AX laid an egg overnight, which could mean that she lost (or dumped) egg #2 & #3 during a possible altercation with a rival bird over the weekend. It's hard to know what actually happened, but there is no reason for a healthy adult to not lay a full clutch of eggs since we know there is plentiful food sources in this urban habitat. Time will tell if she lays another egg or not. The tiercel checks out the first egg which was laid overnight on 3/28-29. The second egg should be laid tomorrow and they won't start incubating until the full clutch is laid. Early March snow on the roof at 101 Hudson St.
March certainly roared in like a lion. 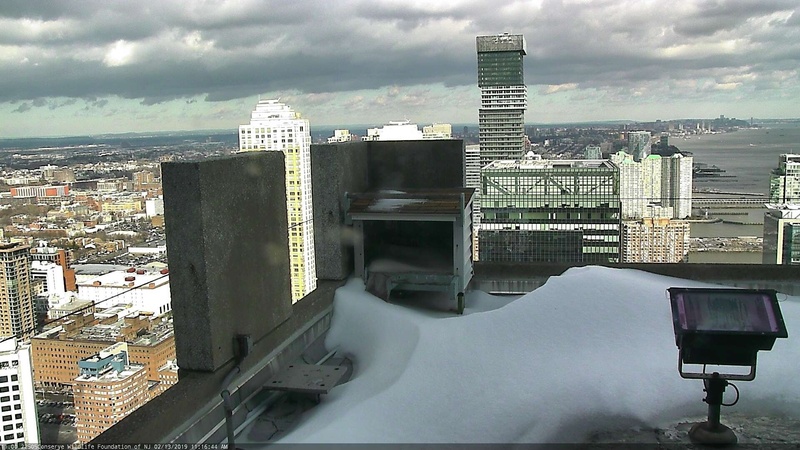 Snow piled up on the rooftop and has lingered with the cool temperatures. Only a small mound is left today. This is quite common to see. I had a memory on Facebook from three years ago where we had to shovel snow on the roof to get to the nestbox to check on the nestbox and cameras... It is still a little early for eggs, but as you can see in the pinhole camera view, there is a very well defined scrape or shallow depression in the gravel. Last year the first egg was laid on 3/26 (4/17 in 2017), so we should start to see 41/AX in or around the nestbox more often as we get closer to egg laying. A well defined scrape or shallow depression where eggs will be laid. Juliet preens on the ledge outside of the nestbox atop 101 Hudson St. Welcome to another year of the Jersey City Falcon Cam! This year marks the 19th year of the Falcon Cam, which we are proud to say is New Jersey's oldest and longest streaming wildlife focused webcam! In the day and age of technology and wildlife webcams galore, we're happy to keep this stream going to highlight wildlife conservation and management in urban areas of New Jersey. Life as an endangered species is fragile, but peregrines have thrived alongside humans and our development when they are given space and privacy to nest and raise young. Buildings like 101 Hudson St. have played a crucial role in the recovery of falcons in New Jersey to 40 known pairs. Partnerships with private building managers (that have suitable areas for nests to be established) who seek to support and benefit from nesting falcons will play a huge role in helping the population remain stable throughout the state. We hope to see the population inhabit more urban and suburban sites to maintain a robust population. The unbanded male inside the nestbox. Is this the same male as last year? With no bands it is hard to tell but we will look at photos from him last year to compare. We visited 101 Hudson St. earlier this week to re-activate the camera(s). No falcons were present when we were there for a short time, but that was expected with the high winds out of the NW that day. Their nestbox was also full of snow from a storm the day before. Today they were both captured on camera in the late morning and it looks like they were scraping in front of some snow in the nestbox. Here is video of the male entering the nestbox. The male also It appears that it's the same pair. 41/AX, a NY'er who will be 7 years old this summer. She started nesting here in 2015.The unbanded male (if it's the same male) claimed this territory in 2016. After the drama over the past couple years, it'll be interesting to see what happens this year. Will the pair produce their first full, healthy brood? Let us know your thoughts or questions over on our Interaction page! Highlights from the 2013 nesting season at 101 Hudson St. in Jersey City, New Jersey as viewed from the Peregrine falcon webcam. This was somewhat of a depressing season for loyal Falcon Cam viewers. The new pair did produce an egg but failed to incubate it. We believe the male was lost during the beginning of the nesting season and was replaced by another non-banded male. Check out highlights from the 2014 nesting season when one nestling was fostered into the nest atop 101 Hudson St. in Jersey City. Highlights from the 15th season of the Jersey City Falcon Cam. There was a turnover in the nestingh pair this year and no young were produced. This was the first year that 41/AX and her mate successfully fledged young! Of three eggs that were laid in April, one hatched in May. BD/62 fledged in mid-July. This year three orphan falcon hatchlings were fostered into the JC Nest. The one eyas produced by this pair was rehabbed and then fostered into another nest off Island Beach State Park. Peregrine Falcon information including life history, habitat, range, reproduction, status and conservation. Introduce Peregrine falcons to your students today! We offer lesson plans to help your students to learn about birds of prey, predator/prey relationships, and much more!